Dining was top-notch, from morning to night. SeaDream I offered just enough choice so there was always something that appealed -- and yet not so many options that the quality suffered. First and most important point: All meals, regardless of venue, were all open seating, all the time. Breakfast was typically served at the Topside Restaurant. Located on one of the ship's top decks, this restaurant was had a "ceiling" of whimsically-shaped canvas so there was always shade, but tables were scattered around the deck as well (we particularly loved a cozy banquette located both port and starboard). At breakfast, you could choose from a small array of cereals, fruits, breads and yogurt at a mini-buffet, and then order hot dishes from a menu. Lunch, too, was served at the Topside and its menus typically consisted of gourmet fare prepared with a light touch. Dinner locales varied. On hotter nights we dined in the Main Dining Salon. It, like the Topside, featured plenty of options for dining for two, four or more, and was elegant in a low-key way. On a couple of really gorgeous evenings, dinner was served at Topside -- and that was absolutely our favorite venue. Spa and vegetarian items were offered on all menus. House-selected wine was copiously poured at lunch and dinner. 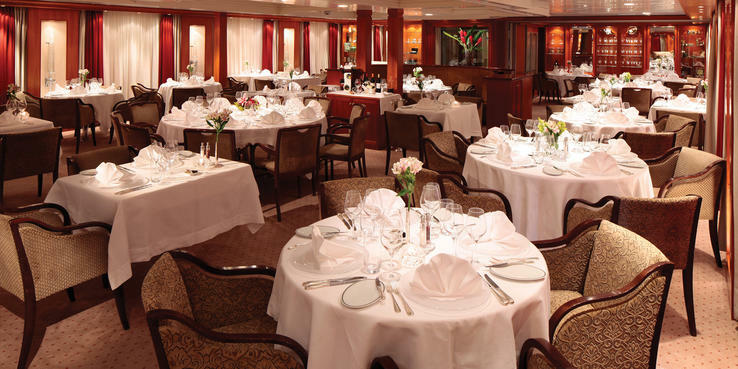 For those who want to splurge, SeaDream has an excellent wine list. The 24-hour room service menu was fairly limited but offerings were excellent. One of the best items was caviar with the appropriate accouterments. We don't mind admitting that it became a daily afternoon ritual for us (and quite a few other passengers). And what was really fun was that "room service" would deliver anywhere on the ship -- so we enjoyed our daily caviar treat poolside, on a Balinese bed, as we sailed between St. Lucia's Twin Pitons, and at the Top of the Yacht Club bar.